Paul says "This is a photo of John Bain, Provost of Cromarty in 1932 and 1935. The details of John Bain I have are: was born on 27 Jun 1860. In 1881 he was a Draper's Assistant in Caernarvon, Wales. He lived in 19 Roft Villa, Bangor, Caernarvon, Wales in 1881. In 1891 he was a Draper in Cromarty. He lived 1 Forsyth Place in Cromarty in 1891. He appears in Court Records in 1915 in Cromarty. He was Provost of Cromarty between 1932 and 1935 in Cormarty. He left �2,451 1 4 (L S D) in his estate in 1938 in Cromarty. He was buried in Dec 1938 in Gaelic Churchyard, Cromarty. He died on 25 Dec 1938 in Cromarty. 9, Hilda, was born on 19 Mar 1896. She died on 26 Sep 1966 in 9 Aberstaff Rd, Inverness. She was School"
picture #589 is an unnumbered version. Is this the same J Bain ..that took many of the old Cromarty Postcards ?? I am trying to find out his background ...and was wondering if this is the same J Bain ? ..any help from anyone would be greatly appreciated . John - this would seem to the same John Bain who published a series of photos and cards from Cromarty. He was not, however a photographer. I have a book from 1900, published by John Bain, entitled a "Photographic view Album of Cromarty and District". All the photos are scanned and on the image Library, and include the famous Fisher Girls shot. The photos seem to have been taken by Valentine's of Dundee. They seem to be the main source for photos for Cromarty Postcards from that time. Thanks Calum ...I was under the impression ..although not a professional photographer ..he took the shots that bore his name on those postcards ?..many I find very interesting in the way he/they captured the town of Cromarty ..even back then ..
John - John Bain was a not a photographer. The shots we see of Cromarty from the late 19th and early 20th Century he used were taken by photographers employed by a large companies such as Valentine's of Dundee. The way that "he/they captured the town of Cromarty" was down to an unnamed and unknown professional photographer who was in the employ of the Dundee company. Local businesses simply licensed those images for their own commercial purposes, such as books promoting Cromarty as a tourist destination. Thanks Calum.. for clearing that up..very interesting ....good advertising then to promote a Draper in Cromarty in those times !! Just visited Cromarty Feb 2014 never seen this photo managed to find Leonard Bain's grave my grandfather whom I never met . My father is James Leonard Bain. I am James Andrew Bain. I am Shirley Alsop maiden name Bain, daughter of James Leonard Bain, granddaughter of Leonard Bain whom sadly I never met. James and Shirley, your father is my 4th cousin!! Hi, good to hear from you. I am Shirley and wandered who your parents were. Shirley, my parents were George Hamilton and Annabella Paterson. The connection is through my mother and my Urquhart line. Your 3x great grandfather Donald Bain married Christian Urquhart. John Bain was my husband's Great Grandfather. If anyone would like more information, I am happy to help. I am Douglas Bain. 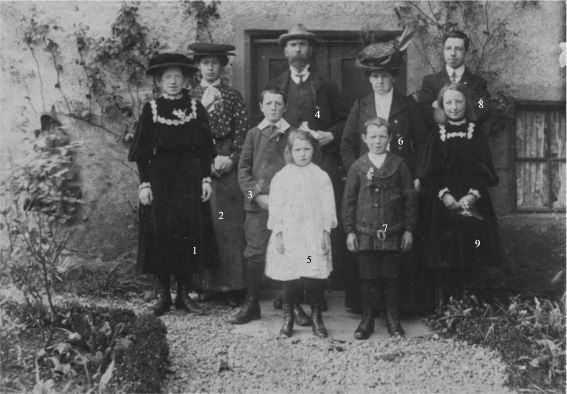 I am Herbert Bain (top right's) Grandson. I only met Florrie and Herbert in the picture. Hello Douglas, glad to make your acquaintance.